There are many favorite color combinations for quilts and blue and yellow is at the top of the list. 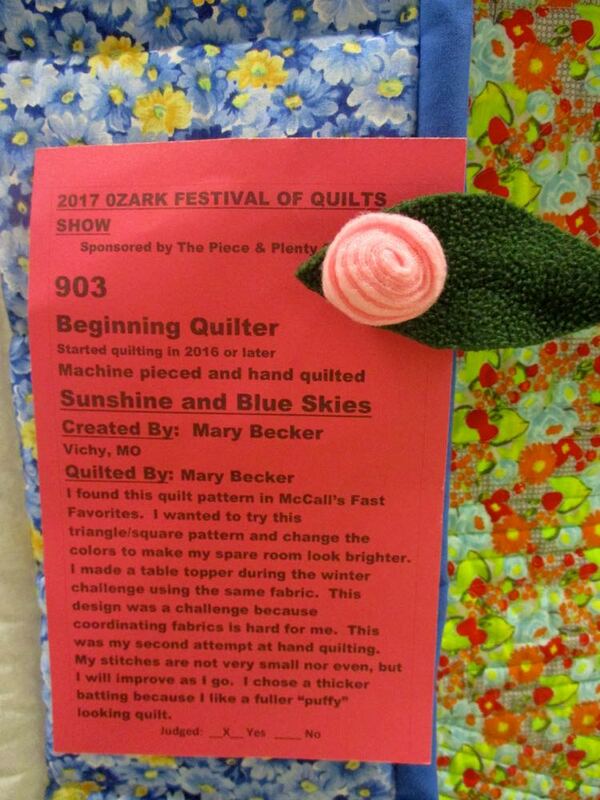 From double wedding ring quilts with this color combination to this lovely entry in the 2017 Piece and Plenty Quilt Guild in Rolla, when quilters start projects they tend to gravitate to this combination of bright colors. I thought about this entry when we were getting a lot of rain. I was missing the blue skies and sunshine of summer, which we had been enjoying without the usual high humidity. The blue and yellow color combination is a classic for cheering up any room. Blue, and maybe more of a blue gray, is still the most favorite wall color for most US bedrooms. Interestingly enough, the blue square designs have different multi-patterned cottons. And if you look closely, the yellow blocks are also a varied fabric pattern. Not surprising, this Sunshine Blue Skies handmade quilt won second place in the quilt guild show. I'm sure that brightened up the quilter's day!